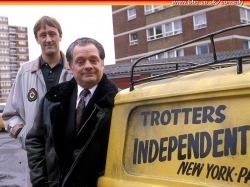 all of the funniest clips from only fools and horses. The chandelier smashing episode was a major turning point for Only fools and horses - it got people far and wide talking about the sitcom. After the Van breaks down on the way to a fancy dress party - Del convinces rodney that it is closer to the party than to go home, so they make a run for it.